Nothing is more satisfying for me than using ordinary household items and a few inexpensive craft supplies to created fun and whimsical Christmas decorations. This trio of Paintbrush Christmas Ornaments all started out their lives as a simple Dollar Store paintbrush! Paint brushes can be made into all sorts of characters. The bristles lend themselves to beards, of course, but color can go a long way towards making them bring a character to life. 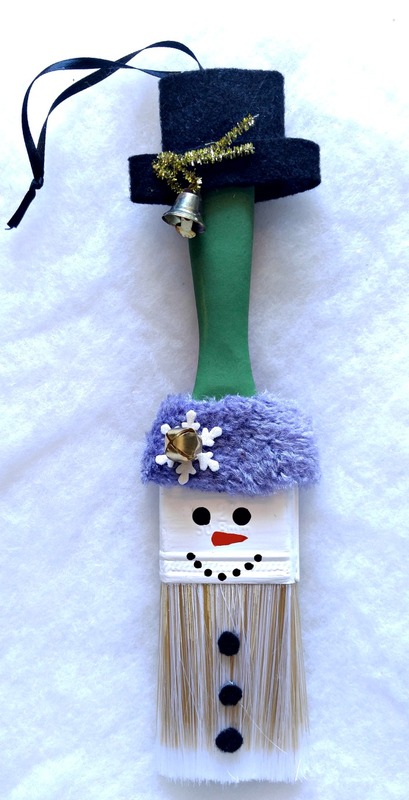 It’s time to raid your craft room and turn these ordinary household tools into cute Christmas characters. This group of ornaments can be hung on a Christmas tree or grouped together as wall decor. They would also make great personal home made Christmas gifts that will be treasured by family and friends. 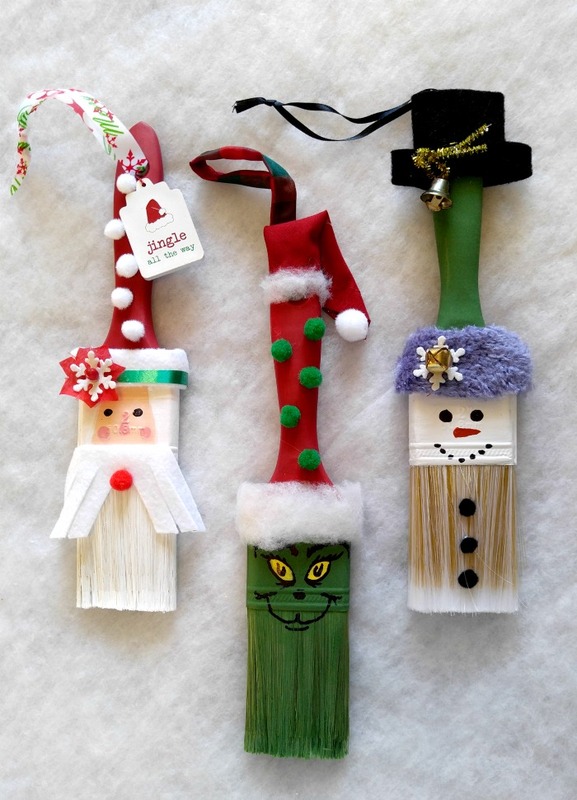 These Paintbrush Christmas Ornaments feature three of the most popular Christmas figures – Santa Claus, a Snowman and, of course, the Grinch who stole Christmas. The ornaments are so cute and your kids would love to join in making them! Pom poms, polyester batting, Snowflake stickers and Felt. 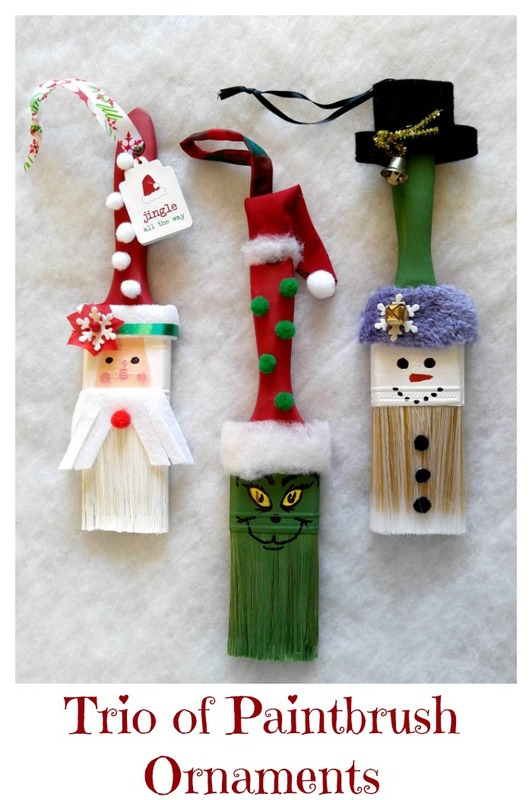 It’s time to meet the Trio of Paintbrush Christmas Ornaments! This adorable Santa Claus ornament has the cutest whiskers and a festive hat made from polyester batting and a slim green ribbon. Painting the bristles of the paint brush gives him a pure white beard and white felt adds some whiskers to match. He will be Jingling all the way this holiday season! See the tutorial for him here. Mr. Snowman is all bundled up for the cold. One of my daughters childhood gloves ended up being used for the collar! It is the perfect texture for a hat brim and makes him look all toasty and warm. I love the way the light colored paint brush bristles look on his body. See the Snowman tutorial here. No Christmas would be complete without a visit from the Grinch who is trying to steal Christmas! Never fear…he won’t win. 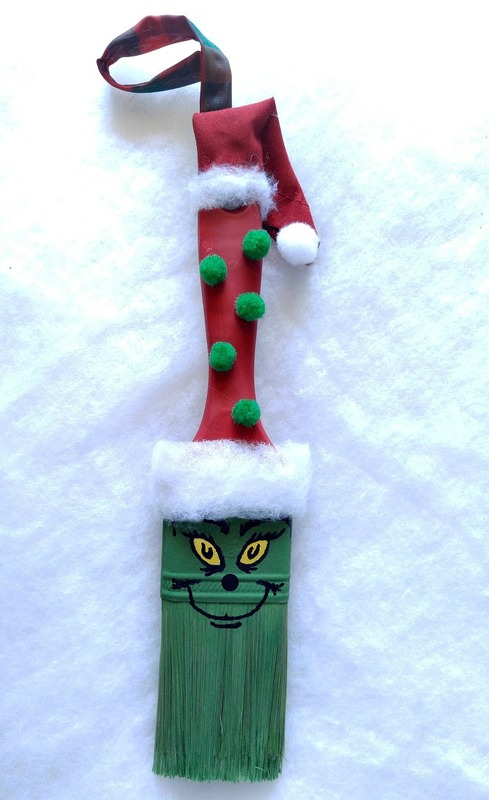 Green paint gives both the bristles and handle the look we know and love for the Grinch Character and his whimsical face is just adorable. The residents of Whoville will make sure of that. Get the Grinch tutorial here. All three of these ornaments ended up costing me a grand total of about $5. They will look so cute on our Christmas tree, and would also add a fun wall hanging, too! Would you like a reminder of this trio of paintbrush ornaments? Just pin this image to one of your holiday decorating boards on Pinterest so that you can easily find it later. Now it’s your turn. What fun item have you made from a paintbrush? Why not upload a photo of your creation in the comments below so that we can admire your handiwork?